DETROIT: Ford Motor Co said it will boost US production of its largest sport utility vehicles in a move to grab profits in a market where consumers favour larger, more comfortable vehicles. 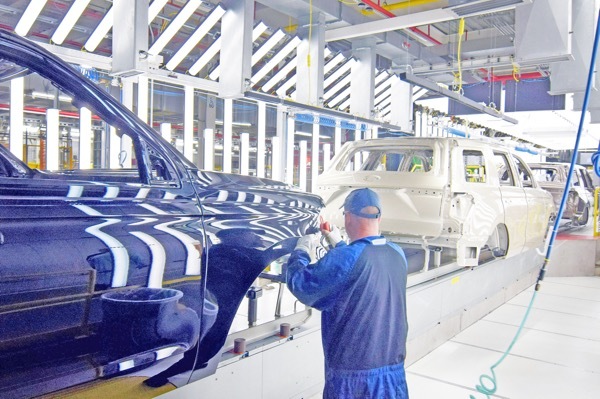 Ford’s Kentucky Truck plant in Louisville will increase the production rate for Ford Expedition and Lincoln Navigator sport utility vehicles by 20 percent in July – the second 20 percent increase in a year for both models, executives said during a media briefing on Monday. The Trump administration, however, has proposed freezing US fuel efficiency standards – a decision that would make it easier for automakers to sell large SUVs and pickup trucks. With gasoline relatively cheap, US consumers are paying premium prices for large SUVs that seat eight people and can tow a four-ton trailer. The average transaction price of a new Ford Expedition is $62,700, Ford US marketing director Matt VanDyke said, up $11,700 from the previous year. Ford does not disclose profits by model line. Average prices for the luxury Navigator rose to $81,000 in February from $78,000 a year earlier, according to Lincoln data. In January, Ford said transaction prices across its US model lines averaged $38,400, above the $34,000 industry average. For the first time, he said, workers at certain stations will be positioned at two levels – some in pits and some on platforms – to install parts on upper and lower sections of a vehicle in unison. Since launching its new big SUVs, Ford has improved its share of the US large SUV segment by 5.6 percentage points, Ford’s VanDyke told reporters on Monday. Ford to boost profit-rich US large SUV production again 0 out of 5 based on 0 ratings. 0 user reviews.